Noelle Healy with Zach Ring, aged 8, from Swords. ©INPHO/Oisin Keniry. 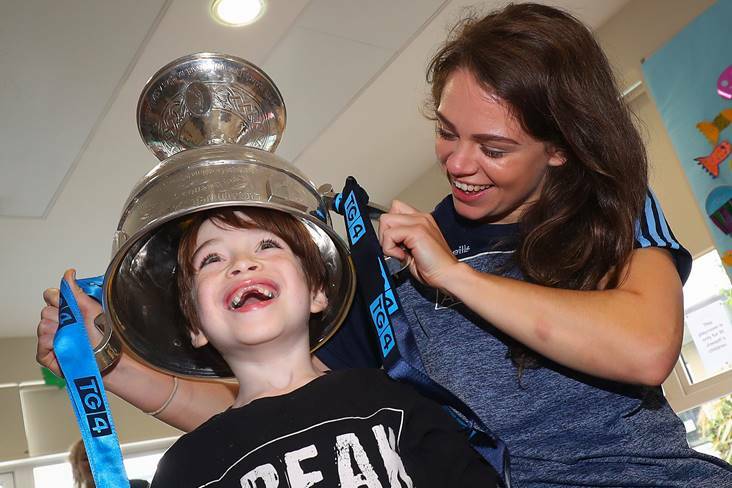 Taoiseach Leo Varadkar’s pre-Christmas call for the medical profession to go over and above the call of duty over the holiday period didn’t go down well with Dublin star Noelle Healy. The four-time All-Star works as an anaesthesiologist in Blanchardstown Hospital and she and her colleagues took exception to the Fine Gael leader’s comments. “I think everybody took a bit of an affront to it,” she told the Irish Daily Star at the launch of marketing consultants Future Proof Media yesterday. “When you work in the hospital, you see how hard everybody works, selflessly giving up time and hours. “Staying back. Covering shifts, and generally you do get very little thanks for the job you do. None of us go into it to get thanks. “We go into it because we’re generally caring people.